The New Ford F-150, with a 3.7 liter V-6 engine, now has the capability of running on compressed natural gas (CNG) or liquid propane gas (LPG) as well as regular fuel. The F-150 can be built so that you have the choice of using either CNG or regular gasoline, or it can be built so you have a choice of LPG or regular fuel. However, it cannot be built to give you a choice of all three. This is because LPG has to be stored at 500 pounds per square inch, or psi, and CNG has to be stored at 3,600 psi. The reason for bi-fuel capability is for the convenience of customers. With bi-fuel capability, if they are close to running out of gas and there isn’t a station around that sells CNG or LPG, whichever the case may be, they can get regular fuel instead. Switching between the two is a smooth transition. The estimated miles per gallon, or MPG, is not much different from the estimated MPG of regular fuel, but the cost of CNG and LPG is less than the cost of regular fuel, which is running an average of about $3.60 per gallon in the United States right now. The cost of CNG averages about $1.30 for the equivalent of one gallon of gasoline and LPG costs about $2.15 for the equivalent of one gallon of gasoline. Another advantage to running CNG or LPG in the Ford F-150 is that they are both very clean running fuels. They actually give off between 20 percent and 45 percent less air contaminating pollutants. 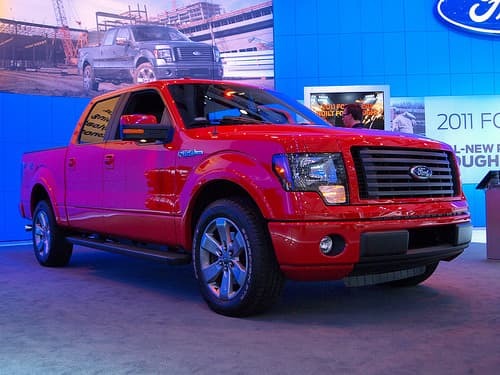 For Ford F-150 owners who only have a gasoline option and would like their trucks to be capable of running on either CNG or LPG, it is possible, but they would have to have it done by a Vehicle Modifier who is Ford qualified. The cost is estimated to be anywhere from $7500 to $9500, depending on the size of the fuel tank. However, this option, when installed at the factory, is only $315. Customers with a fleet of vehicles and other businesses have been requesting that Ford make the CNG capable F-150 so that they can enjoy the low fuel cost and do their part for the environment. It is estimated that, with the money the fleets save by using CNG, their fleets could start to pay for themselves in about two to three years.